Consoles and set-up box with Android begin to popularize and Razer decided to enter the competition with its Forge TV. The device, equipped with the Android TV, has powerful settings to run any title available in the store Google Play Store, as well as stream music, videos and apps to your TV. We had access to the device in the CES 2015 in Las Vegas, and brought to you our first impressions. Forge TV is a very compact device which can be placed anywhere in the room. To get an idea, you can hold it with one hand. Overall, the gadget resembles Apple TV, bringing up similar features, but with a clear purpose: the games. In order to accomplish your goal, the device brings a quad-core processor Snapdragon 805 2.5GHz, 2GB of RAM and 16 GB of internal storage with no possibility of expansion - which can be frustrating in some ways. The Forge TV also features HDMI ports, USB 3.0, network input and connectivity Wi-Fi and Bluetooth. At the level of comparison, this is almost the same hardware Galaxy Note 4, however, with 1GB of RAM less. It's almost like having a top of the line smartphone connected to the TV in your living room. The user experience of TV Forge is quite intuitive and complete. The Android TV device brings a very clear interface, menu-driven vertically and apps icons and games horizontally. The system provides support for voice search, Google Now and also the Google Cast, allowing the user to transmit smartphone content, tablets and computers directly to the TV. The Forge TV can be controlled with any control compatible with Android and also with the Xbox . However, the company offers a joystick own separately, Razer Servel, which has all the necessary controls for navigation on the rigging system. In addition, there's an app for smartphones and tablets that can be used as controls for menus. The Android TV also brings the Play Store, where you can download applications, games, music and even rent movies. Unfortunately, not all apps and games are adapted to run on Google TV. However, options known as Spotify, Netflix, Minion Rush , Bomb Squad and Goat Simulator are now available. Check out the full list of apps and games. 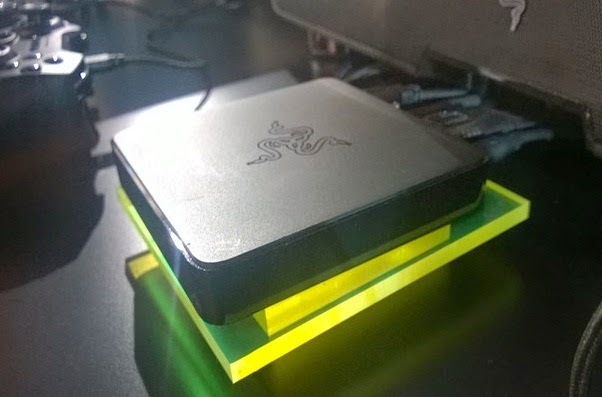 Leaving for the games, the Razer device is capable of running games in Full HD resolution and with high quality. However, this also depends on the developers, who must adapt their titles for TVs. Obviously, the quality of graphics is not nearly the details of the last generation of consoles, but the result is very satisfactory for the price of the device. During our hands-on test, we played the Bomb Squad and also Reaper. Both games were very well suited, with even tutorials on using the joystick. The gameplay in Razer device tends to be much nicer than the touch screen by smartphone. In Servel, for example, the user has access to the same amount of gifts buttons on the joystick Microsoft, which opens up many possibilities for the control of the game. The Forge TV also supports the use of up to four wireless controller simultaneously, bringing the possibility of multiplayer games. The player can add their achievements in Play Games and challenge other users in matches over the Internet. Unfortunately, you cannot pass the Forge TV content to play on the mobile screen, similar to what Sony is among the Xperia Z 3 and the PlayStation 4 . However, some titles bring cloud synchronization progress, which enables get a game in the apparatus of Razer and continue the game on the Android smartphone, and vice versa. The Forge TV will be launched by Razer until March for $ 99, in a package with just the appliance. Have the kit with the set-up box and Servel control can be found in the amount of $ 199. In general, the Forge TV Razer promises to be a complete device for those seeking entertainment and want to expand the functionality of the TV with Android TV. Support for applications from Play Store and Google Cast cause the device to turn your TV on the central apparatus of the room, avoiding the connection with tablets, computers and mobile phones. In what concerns the games, the Forge TV should appeal to more casual audience, seeking titles for a momentary fun and do not want to shell out a very high value on a next-generation console. In addition, one must consider that Android TV has only months to live and that the number of titles tends to grow further. To become more complete and complex, the Razer device will become even more attractive.